The 2018 Honda City facelift was recently released in the UAE. The sedan is available in a total three trim choices - the DX, LX, and EX. All the variants share a common powerhouse, i.e. a 1.5-litre SOHC i-VTEC petrol mill that generates 119 PS of maximum power and 145 Nm of peak torque. This mill comes mated to Honda new-gen CVT transmission and has a mileage rating of 20 kmpl. The facelifted model comes with a restyled exterior that includes a new honeycomb grille, LED DRLs, diamond cut alloy wheels, and revised tail lights. Additions to the interior include a touchscreen display, cruise control, engine start-stop button, paddle shifters, automatic air-con system, and 60/40 split rear seat. The all-new City comes with a host of standard safety features like ABS with Brake Assist and Electronic Force Distribution, stability control, and SRS dual front airbags. Have a question on City? City is available in 1 different colors - Alabaster Silver Metallic. Watch latest video reviews of Honda City to know about its interiors, exteriors, performance, mileage and more. The Honda City has been one of the most successful models for the Japanese markets not only in the UAE, but also across the world. It is with this model that Honda has tried to expand its foothold in almost all the emerging markets all over the globe, and it has been successful in doing so. Unlike in other markets, in UAE, the Honda City serves as the range starting and the most affordable model for Honda in the country. Currently available in its latest guise, the UAE-spec Honda does miss out on some of the features available in the versions of City in other countries. The car is available in three different variants – DX, LX and EX. The Honda City has always been praised for the plushness and comfort its interior cabin provides, and this latest generation Honda City is no different too. The overall cabin has been lifted off from the previous model, although the introduction of a couple of small features jazz up the interiors. The three-spoke steering wheel with the generous use of silver finish in the lower portions of the spokes make it look chunky and good to feel. The three-pod instrument console looks simple, however, the blue backlit theme, chrome surrounds for all the three pods and the full TFT third pod for the MID lit it up. The asymmetric center console, like in all the Hondas, is slightly shifted towards the driver, which thanks to the heavy usage of silver and piano black around it, make it look rich and premium. The 7-inch touchscreen unit for infotainment system cover up the basics of the audio system as well as camera, however, it lacks in the modern smartphone connectivity options like Android Auto and Apple Carplay, which are now available in lower priced cars. Though, the full touch sensitive panel for climate control looks nice and provides a feel-good factor to the otherwise very simply laid out dashboard. The UAE-spec City comes kitted with the basic features like rear AC vents, push button start with keyless entry, cruise control, 8-speakers, 60:40 rear fold down seats. We would have surely liked to see more features, considering the fact that its international versions, which are styled as same as this version, comes loaded with many more features, including the very popular sunroof. Also, the interior cabin has been here for a very long time, since the previous version of the City, and with no changes introduced here, it has started to show its age. 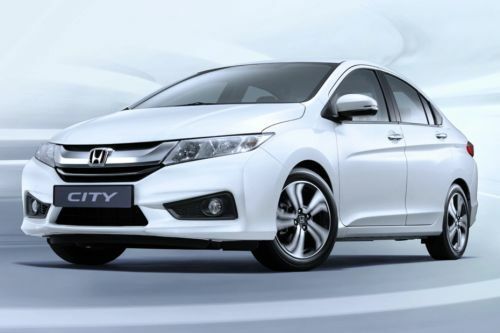 On the outside, the Honda City retains the arrow shot design philosophy of its previous generation model, although it has been tweaked to make it look as upmarket as possible, thanks to mild changes at the front and to the alloy wheels, which make all the difference. At the front, the Honda City has got a thick single slat chrome grille, with redesigned air dams to make it look more aggressive than before. The angular headlamps are same as before, save for the introduction of new LED DRLs in its exterior corners. However, considering the competition has moved up in integrating projector or LED units for the main headlamp, the Honda City somewhat feels lacking here. The side profile continues to be same as before, having an eye-pleasing aerodynamic profile. The sharp and thick crease running all the way from the middle of the front door towards the rear tail lamps adds some character to the side profile, while the 16-inch diamond cut alloy wheels make it look more sophisticated than before. The rear of the Honda City has remained unchanged, with the swept back tail lamps being nicely styled, although like the front headlamps, they too miss out on LED units. The tail lamps are joined to each other with the help of a thin strip of chrome. All in all, the Honda City still looks sporty and sophisticated at the same time, which is a balance hard to match. The Honda City comes with McPherson Strut with Coil Spring at the front and Torsion beam axle with coil spring and anti-roll bars at the rear, which do sound basic, however, this suspension setup has been tuned for a very fine balance which does not compromise on either riding comfort or driving dynamics, thus set at a perfect balance. The 16-inch wheels have enhanced the overall driving dynamics by a small margin, which is a welcome addition. The City still excels in the way its interior cabin space has been setup with the car still benchmarking in terms of legroom, headroom and shoulder room. Hondas have always been known for its rev-happy and incredibly refined petrol engines, and the City too falls under the same category. Powering the Honda City is the manufacturer’s smallest petrol engine for the country, a 1.5-litre four cylinder petrol motor, which has the ability to develop a maximum power output of 118 bhp and a peak torque output of 145 Nm. In all the three variants in which the City is being offered, this refined and smooth engine is mated to a simple CVT transmission, which do get the option of paddle shifters in the top-end variant for seamless yet enjoyable driving pleasure. Considering the fact that it is an entry level model, we expect Honda City to cover only the basic safety features and miss out on other hi-fi electronic driving aids. Still, with the presence of dual front airbags, ABS with EBD and Brake Assist, Vehicle Stability Assist and Tire Pressure Monitoring System, the City feels safe and assuring enough for the passengers inside. The Honda City has always been known for being that one model which sets and covers up all the basics of a car in a right manner. The UAE-spec car, in its latest iteration, might not have received much deal-braking changes, and it still misses out on many features that are available in its international versions. However, the car still manages to look athletic and premium at the same time, the engine still feels refined and powerful even after existing in the same form for a long time and the levels of interior space and comfort which the City offers is still second to none in the segment to which it caters. What is the price of Honda City? On road prices of Honda City in starts from AED52,900 for base variant DX, while the top spec variant EX costs at AED63,900 . What are the colors options available in Honda City? Honda City vs Toyota Yaris: Which one has edge over the other?